As the days turn into months, the loss of my beloved grandmother has NOT gotten easier..y'all lie :) In just a few days I'll turn 28 again..on 9/11 (shut up...I already know what you guys are thinking..just go with me on this)... and this is the first year that when I go to the mailbox, a birthday card with my grandmother's handwriting and a $5 bill won't be in there. The phone won't ring with her laughing in my ear trying to sing happy birthday, and she won't be waiting by the phone the next day to find out what birthday shennanigans I have managed to get myself into. If that's not enough to send you down a strawberry limerita well of despair...add in the other ish going on in my life..
Not only am I STILL trying to bounce back from a simple procedure to remove fibroids back in June (that I can't really go into right now)..the hits just keep coming. And if one more mofo'n person asks me WHEN I'm coming back to the plantation I just might snap. 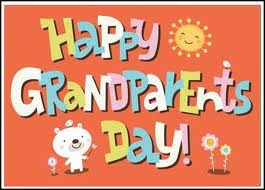 But this blog isn't about the dark tunnel that I am currently in..it is really to just honor Grandparents Day. Hell, I didn't know that existed until today, I celebrate my grandparents everyday. Granted the past few weeks I have cried my eyeballs out to the point I am walking around with puffy lids simply because I NEED MY GRANDMA RIGHT NOW. She was my strength..the person that could make sense of all things that seemed like the debbil himself crafted it, and she could make me laugh and see that all my fears and frustrations were just silly. Today on Grandparents Day I'm reminded that I still honor her and her advice (as well as ALL of my grandparents) every minute of every day.. what you mean Meik? You know I love lists right? Well here we go..
2. Carry mace when you go for walks..ok so I have YET to follow this advice, but the good news is..I remember it so that counts for something right?? Tho, a couple of weeks ago I could have used this when I had a stare down with a scraggly dog in the neighborhood..I don't do dogs..atall. Hell I can barely walk right now much less run from the scariness that is Rover. 3. Always say thank you, and show your appreciation. It's always nice to have someone to care something about you. I remember my grandma telling me that about my granddeddy when she was sick...right before she added it was too late for her to start over and find someone new LOL. 4. Sometimes you have to say NO! Don't let people run over you. This proves to be true in every aspect of life..I'll be damned if I let a certain debbil run over me, and don't feel not one ounce of sympathy to the ones that let her do it. I know this one is cryptic, but my grandma knew exactly who I was talking about and this was her advice. 5. When in doubt on how to make some ish..just go to the store in buy it LOL. If you followed my blog on the disappearing cupcakes then this one makes total sense. I could go on and on but the point is..the advice and lessons you learn from your grandparents are priceless and money can't buy that..so appreciate your grandparents while you still have em, take it from me, it hurts like a mofo and a half when you can't pick up the phone to call them to hear that advice...I am so grateful for the many conversations we had so I can literally apply some of that advice to various situations. I know she'd also be telling me to quit telling her biz on this inna-net LOL..
Bottom line tho..I love my grandparents..all of em. I'm especially blessed to have been able to know my great-grandmothers also. Do you guys have any advice from your grandparents to share??? These days my grandma is preaching self preservation heavily. She says always look out for you first! It's all fine and dandy that you have a good heart, but taking on the burdens of others before addressing those of your own is bad on a good heart. Hm. So many to choose, but I think her saying that my decisions will determine my life resonated the most.